This month the Simple Stamping Techniques team are showcasing step cards. I am using a very simple stair step card that I first saw on Pinterest but I’ve just tweaked it a bit to round out the metric measurements. This card is for a niece who has just had a wee baby boy. For this card I used Sweet Baby Bundle (AC page 89 148344) and Labeler Alphabet (OC page 175 141936), Rectangle Stitched Framelit Dies (OC 148551), Twinkle Twinkle DSP (AC page 189), Soft Seafoam Cardstock (AC page 186), Blends used were (AC page 205 Soft Sea Foam Light 148057, Pool Party Light 144595 and Petal Pink Light 146866. This card folds flat into a normal envelope. So here is my template. You will also have to cut a mat to the middle back panel and this measures 10.5 x 10.5cm. You will also need a 10 x 10cm DSP for this panel too. For the 3 cm and 4.5 cm panels you will need to cut the DSP at 2.5 x 10cm and 4 x 10cm. Check out the other Design Team Cards this month. Our April online tutorial is now available for purchase! This month we are using the Amazing Life Bundle. We are also having a blog hop to showcase this bundle and here’s my card. I used 3 different colours of ink for this card. Call me Clover, Garden Green and Tranquil Tide. Tranquil Tide will be retiring soon so don’t forget to stock up on ink and cardstock before it is gone for good! The Stamparatus (AC pg 207) was invaluable here for this card. Easy to do and I love that I can just move the plate down a notch. I’m in love with these thinlits and have used them a lot ..especially on my scrapbooking pages. Great as a frame/journalling spot too! I also used this bundle on our February sneek peek ..you can see that scrapbooking page over on my Facebook business page. Just a reminder that these 6 online tutorials will cost you $10.20 NZD available from me or, if you order more than $37 off me you will get this tutorial for free! If you are in one of our other markets ..then contact one of our Design Team Members to purchase the tutorial off them. They are Alisa Tilsner, Ashley Fifer, Danielle Bennenk, Jenny Hall and Martin Stone. So off we go on our blog hop ..Click on the little blue frog to go to the next Design Team Member. Now I just love doing mixed media Layouts ..you can see a few of my previous ones in my scrapbooking gallery. Here is my LO using Embossing Paste, spritzed ink (Ink + isopropyl alcohol), tissue, torn edged paper and wooden and resin elements…Voila done! The new Beautifully Detailed Laser Cut Specialty Paper (OC page 48 148812) is a must to get in my opinion! The tissue is from this pack too. I also used the Painted Seasons DSP which is available as a Sale a Bration until the end of this month. This photo is one of my favourite photos of our Daughter at 3. She was a confident wee girl who loved the farm life, helping her Great Great Aunt (her stand in Great Grandmother), stewing fruit, gardening and having a wee chat about life. Lots of lovely memories. My Design Team Member Courtenay is next on the blog hop list …This blog hop is amazing!!!!! Heres a video of it! I’ve also had a couple of Downline promote just recently so these are the cards I made for them. Each one personalised for them. 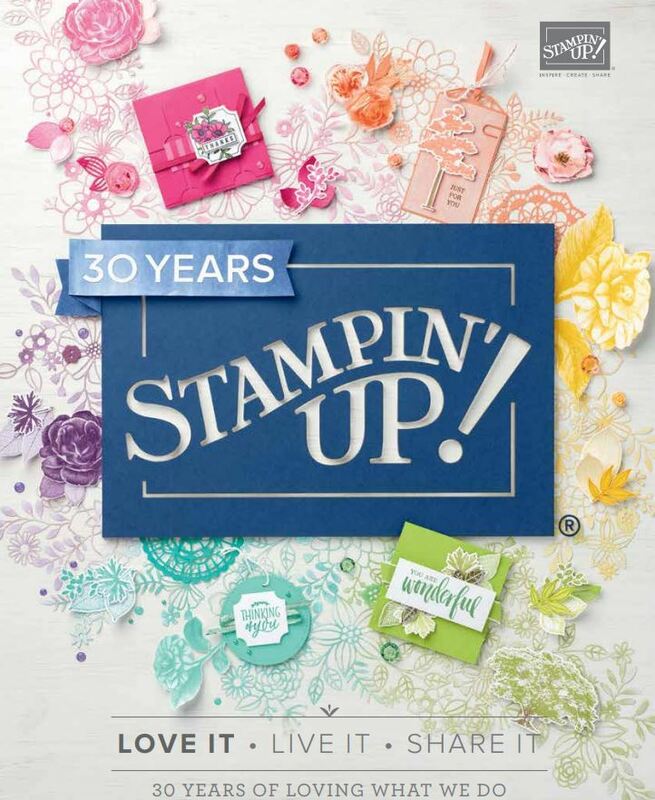 If you are in New Zealand and would like to know more about joining Stampin’ Up! Getting a personal discount/ and/ or being a teacher/ and/ or running it as a business then contact me. Welcome to another ESAD Blog Hop! This month we are showcasing products you can earn in Sale a Bration. You know Im a paper loving girl so BOTH DSP get the green tick with me..but everything else on this flyer is the bomb too! I love using the pizza boxes and have used up so many packs over the past year. The same goes with the pearlized doilies and the Delightfully Detailed Specialty cut paper. The Painted Seasons DSP however is new for Sale a Bration as is the Country Floral Dynamic Embossing Folder so today I am showcasing these. You can get one of these for free by purchasing some Occasions Products and/or some Annual Catalogue products. A customer of mine is a nurse who deals with stroke victims so I made this mini pizza box of cards for her to give out to some of her patients. I teamed it up with Artfully Aware Stamp set (149447 Pg 46 OC $48) and the coordinating dies (143749 Pg 220 AC $46) and added in some Whisper White (thick 140490 or regular 106549). You will then have enough to get one level one Sale a Bration item. Which one would you choose? For this Mini Pizza Box of cards, I also used Poppy Parade Ink (147050) and Poppy Parade Ribbon (147813)..Both $15.75 each. This emboss technique is a very simple one. All you have to do is ink one side of the Embossing Folder (the side that has the writing on) with Poppy Parade Ink. Pop in your mini pizza box or Whisper White cardstock and run it through your Big Shot and voila! This is the result! Easy but messy! Just rinse off your embossing folder afterwards under the tap and let dry. If you live in New Zealand feel free to contact me to place your order using any of these products and earn some Sale a Bration rewards. My email address and link to my online shop is over on my sidebar. Dont forget Sale a Bration finishes this month! Okay off we go to Jessie Holtons blog for more inspiration using Sale a bration and how you can get items for free. Below is also a list of the participants. This month at Simple Stamping Techniques we are using Wooden Elements on our projects. These are some of my favourite things to use on my Scrapbooking Layouts and have used these embellishments for many many years! I love dimension on my cards and scrapbooking pages and have done this page as a beginner scrapbooking page. I went on my first cruise with my Besties just recently. We got all dressed the same to get on the boat and to then go to the sail away party after sailing! I’m in the process of making a video of how to do this page so check back here for the link when its done…or you can follow my facebook page where I will post the link. I’ve just started video tutorials so its a huge learning curve! Here are some close ups of my page. Check out the other Design Team Members below to see what they have come up with using Wooden Elements. Welcome to our March Tutorial! It is now available to purchase! Here is a sneak peek for you of our projects using the Flowering Desert Stamp set. So today we are also having a blog hop showcasing this stamp set. Here is mine! I used a couple of the stamps to make a sunflower! My colour of choice was Crushed Curry. Love that colour! My online tutorial goes over what I used for this card too. Check out the other Designers in our Blog Hop by clicking on the little Blue Frog below. You can email me ..you can find this on my sidebar. Or you can message me on facebook to buy. Link to my Facebook page is over on my sidebar too.